Up to this present time I am already on operations eight times against the enemy, and now I am looking forward to many more missions. I am altogether nine year a Pilot. When the Germans enter Czechoslovakia I escape to Poland. I am fifteen days in Poland and then I come to England and here I am told that I should proceed to France with a group of twenty five other Czech airmen. I am wanting there to join the French Air Force but there are difficulties, so instead I make application to join the Foreign Legion. All this group of twenty five join also, in accordance wit advice from the Czech authorities in Paris and we go to Africa. At first we are employed as workers building highways. This was very difficult in tis climate, which is quite unusual to us. Then, after some time , we start with normal French drill for infantry so that when these si months are over we can be regarded as French Legionairres. During this time, however, the Czech authorities in Paris have made the necessary steps for us to join the French Air Force and when at last they have succeeded in this, all those Czech airmen in the Foreign Legion are sent to different stations in Morocco. I spent another two months as Pilot in the French Air Force in Africa; then I am sent to France and when France collapses I am coming to England. That is in August 1940. 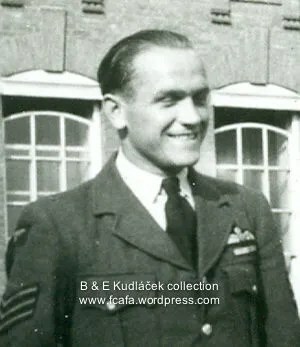 When I am here it is not necessary for me to make personal application to join the RAF because everything has been arranged for us beforehand, and so, after a little time I join Czech Bomber Squadron. In these eight missions I have made with them, I am sent to eight different places: – BERLIN, BREMEN, HAMBURG, WILHELMSHAVEN, ESSEN, all in Germany and to these French Channel ports of DUNKIRK, CALAIS and LE HAVRE. Three times I go as second Pilot and then I am promoted Captain of Aircraft. The raid at HAMBURG is my most successful I think. This raid was made on a full moon night. We succeeded in making an approach almost unobserved with complete silence on the part of the German guns on the ground, but so soon as we drop our flare, then immediately this anti-aircraft defence starts most violently and there are many searchlights also. I will never forget these thirty minutes which we spend over HAMBURG simply trying to find the prescribed target in the docks. All the time they are firing at us very much. Then mine Observer tells me “O. K.” “now I am Bombing”. He tells me it is very good, his bombing. I see a big fire start and then I hurry for England. At my first bombing missions I have felt some excitement but now I am quite accustomed to it and I do not feel any excitement at all. Upon one occasion when I am second Pilot we have to jump from our Aircraft by parachute. To start with it was a very good flight this. We got to BREMEN and we drop our bombs. Again these bombs are dropped at full moon and I am quite sure they are dropped on the docks. There is much anti-aircraft fire there is also, but again we are not hit. In all these eight missions my Aircraft is not hit. This time w start to cross the Channel, we are proceeding in cloud towards England and ice is starting to form on our Aircraft. Because of these icing conditions, our wireless set simply ceases to work, so when we reach the shores of England we are without any guide at all. It is cloudy, windy weather aith complete darkness, and we are about half an hour after midnight. It is so bad that at first we cannot recognise whether we are above the sea or above land though we have come down to less than five hundred feet. In the end we see the waves and the white foam and this enables us to recognise the shores. We are hoping that the Wireless Operator will succeed in repairing the deficiency in his apparatus but it is not so. We remain in the air as long a fuel enables us to and then when we are still finding nowhere to land, the Captain is obliged to abandon Aircraft. I am to go first. I shake hands with all of them and I go out through the front hatch. We are now at two thousand fee. I make two somersaults and then I pull the rip-cord. I am wondering vey much if this parachute is going to open. I have never jumped before. Then I have a feeling of the parachute coming out of its cover which is on my back, and next there is a jerk when she opens and I start to swing in the air like a pendulum. It is raining very heavily and I am becoming soaked, As I descend I notice a road and I shout, but nobody is present. During this final period of descent I am prepared to land with my hands or my feet first but unfortunately I first hit the ground with my face. I receive such a shock that it compels me to lie for some minutes to recover. Then I find that I am in a meadow. I shout several times but with no result, so I fold my parachute over my arm and I walk until I reach a house. When I knock on the door and shout again, there is a lady whose head appears from a window and I ask for help. This lady immediately vanishes and at once a gentleman appears at the same window with a gun which he points at me. When I see this gun, I am so weak already through all these events that I faint, and next I find myself already in the house in an easy chair. When they have made sure of me they are very kind, and they give me hot tea with whiskey in it. The Police and a Doctor are sent for, and when the Doctor arrives with his car he takes me to his house. He offers me a bath and pyjamas and a bedroom, and something to eat and then I go to sleep. I am sleeping only for thirty minutes when the front gunner arrives also. He explains that he had to hang for one hour from a tree with his parachute before succeeding to release himself and dropping to the ground. But soon after this incident we are back once more on Operations. F/Lt Leo Anderle was killed on 10/12/42 when his Halifax aircraft, NF-Y W1002, of 138 Sqn disappeared on a flight between Cairo and Malta, no survivors from his Czechoslovak crew or the ten passengers onboard were found. They are commemorated on the el Alamein Memorial, Egypt. Article curtesy of the Anderle family. This entry was posted in 311 Sqd, Autobiography. Bookmark the permalink.